DOriginal Editor - Your name will be added here if you created the original content for this page. Multifocal motor neuropathy (MMN) is a rare disorder that predominantly causes weakness in the distal limbs. The disorder is purely a motor neuropathy that presents asymmetrically and progresses slowly. An electrophysiological characteristic that distinguishes MMN from a motor neuron disease is a conduction block. Axon death occurs due to the lack of conduction which can lead to an entire nerve being affected. The nerves that are typically affected are peripheral nerves and more commonly the radial, ulnar, median and tibial nerves, however; MMN can affect other nerves as well . Since its symptoms are similar to that of Chronic Inflammatory Demyelinating Polyradiculoneuropathy in that they both occur due to a conduction block, it has been said that MMN is likely an immune-mediated neuropathy. 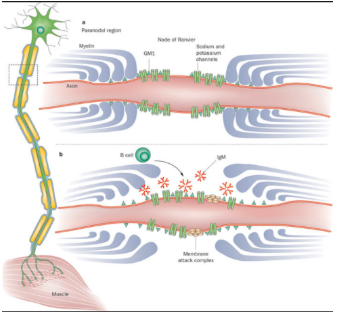 Figure 1: Depicting the axons of individuals with MMN and showing how the conduction of electrical signals can become blocked. MMN more commonly affects males in comparison to females with a ratio of ~3:1. Symptoms do not usually appear before the age of 50 years old. However, men can experience an earlier onset of MMN symptoms in comparison to females . MMN is not typically found in individuals over 70 years old. The disorder is very similar to amyotrophic lateral sclerosis, however; MMN is seen as a treatable disorder with a good prognosis. MMN does not often negatively affect an individual’s lifespan, however; quality of life is often compromised due to symptoms like poor dexterity in manual tasks that are needed for activities of daily living. When compared to other diseases such as lower-motor-neuron disease, patients with MMN have a better overall prognosis. MMN is a disease that progresses steadily. Despite the progression of the disease, those affected tend to have a normal life expectancy. The underlying pathological process of MMN still remains unclear; however it appears to be immune-mediated, with GM1-specific IgM antibodies playing an important role . A common characteristic of MMN is a motor conduction block, which is evident in electrophysiological studies. These studies have examined whether motor axons are able to propagate action potentials. The decreased ability to propagate action potentials present in MMN, coupled with axonal death lead to motor deficits which create several of the problems related to MMN. The pathological process responsible for decreased action potential propagation may be related to dysfunction of the nodes of Ranvier, which can lead to action potential conduction failure. It has also been suggested that demyelination may occur; however limited evidence and research has not been conducted. Given this information, nerve dysfunction related to MMN appears to be more generalized rather than specifically related to nerve conduction blocks. Further research is still required in order to better understand the pathological process of MMN. Asymmetrical distal limb weakness, which follows a nerve path, but does not include sensory loss (typically tibial, radial, ulnar and median nerves). Wrist drop is usually the first symptom seen along with foot drop and a reduction in grip strength. Symptoms typically start in the leg and then move to the arm. Later on symptoms may move to the upper arm but rarely move to the upper leg. Weakness tends to increase when exposed to cold environments. Patients who have the disease for a long time will commonly experience muscle atrophy. Cramps and fasciculations appear in over 50% of patients. Decrease in tendon reflexes in the affected muscles are common. In rare cases, respiratory issues may occur because of the involvement of the phrenic nerve. Over 50% of patients experience significant fatigue that affects their daily living and careers. Diagnosis of MMN is found using clinical and electrophysiological characteristics. The results can be supported by using ancillary investigations which may present as normal or slightly elevated CSF protein, abnormal signals in the brachial plexus as seen in an MRI, and blood work to assess GM1-specific IgM antibodies. Ultrasonography has also shown enlargements along the brachial plexus in about 90% of patients. 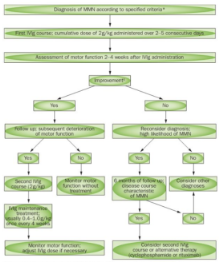 Figure 2: Flowchart of method of diagnosing MMN. Treatment and management options for MMN are limited. Early recognition of the disease is essential in order to prevent and delay axonal loss. Currently, high-dose intravenous immunoglobulin (IVIg) is the standard treatment for patients suffering from MMN and if used early on, it may prevent axonal damage. The use of IVIg has been shown to have improvements related to muscle strength and reduced disability. However, the decreases in disability tend to primarily be attributed to improvements in muscle strength. After several years of prolonged IVIg use, neurological deficits may progress despite a continual increase in dose of IVIg. This is most often due to continuing axonal degeneration which results in reduced muscular strength . Side effects of IVIg include rashes, chills, fever, mild hypotension or hypertension, nausea, malaise, headache and mild arthralgia. In order to determine the optimal dosage of IVIg, both muscle strength and muscle function should be monitored to optimize function. Other immunomodulatory therapies have been suggested, however mixed results have been found. Prednisolone and plasmapheresis appear to be ineffective in treating patients with MMN and may even have negative effects .Cyclophosphamide, which was the first drug used to treat patients suffering from MMN, has been shown to be effective in some patients, however its adverse effects prevent its long-term use. Differential diagnoses for MMN include Amyotrophic Lateral Sclerosis, Lower Motor Neuron Disease, Chronic Inflammatory Demyelinating Polyneuropathy and Lewis-Summer Syndrome. Physiotherapy can play an essential role in delaying and preventing the progression of the disease, and managing symptoms in order for individuals to regain functional independence. Currently, there is limited evidence regarding the role of physiotherapy for this condition, however; based on symptoms reported in MMN, a physiotherapy program can be based upon the most prominent clinical features a patient exhibits. Muscle weakness was reported in 80.0% of individuals and muscle atrophy was reported in 60.0% of individuals with MMN. In order to address these concerns, a treatment plan should focus on strengthening affected muscle group in functionally relevant and meaningful ways. Muscular endurance has also been shown to be limited in 52.5% of patients with MMN, therefore treatment should focus on performing endurance activities that are feasible and meaningful to the patient. It has been found that muscle twitching occurs in 38.8% of patients and muscle cramping in 33.8% of patients. Treatment methods to address these problems may include stretching and therapeutic massage. Additionally, physical therapy exercises, heat therapy, ultrasound, electrical stimulation and trigger point injections may also be included as treatment interventions. Patients suffering from MMN also tend to experience muscle fatigue during sustained voluntary contractions. Therefore, strengthening and endurance exercises as discussed above should be implemented in order to address muscle fatigue during physiotherapy sessions. Evidence has shown that individuals with MMN are still able to engage in physical activity and/or sports regularly. Research has also shown that physiotherapy appears to be an effective non-pharmacological intervention for individuals with MMN, which demonstrates the importance of physiotherapy and exercise for these individuals. Modifications and adaptations to exercises may be used as needed. Physical therapy should focus on activities that are appropriate for the patient’s abilities in order to remain physically active and prevent the negative effects of MMN. Furthermore, evidence has suggested that excessive exposure to cold temperatures is detrimental to individuals with MMN as it causes inhibition of the sodium pump. This may lead to a depolarization block and subsequent axonal degeneration. Based on these findings, avoiding extremely cold temperatures is important. Environments such as a comfortable clinical setting or therapeutic pool may be beneficial. A therapeutic pool provides an environment with a controllable temperature, a safe setting and improves a patient's stability by offloading the weight of the body. It also provides different proprioceptive inputs than those experienced on land. The warm temperature of the pool has also been shown to aid in muscle relaxation. Education on how the cold can exacerbate MMN symptoms is also important. Further research studies for physiotherapy management are required in order to validate these suggestions and enhance treatment interventions. ↑ 18.0 18.1 18.2 18.3 Nobile-Orazio E. Multifocal motor neuropathy. Journal of neuroimmunology. 2001 Apr 2;115(1):4-18. ↑ Hughes P. 79th ENMC International Workshop: Multifocal motor neuropathy. Neuromuscular Disorders. 2001;11(3):309-314. ↑ Olney R, Lewis R, Putnam T, Campellone J. 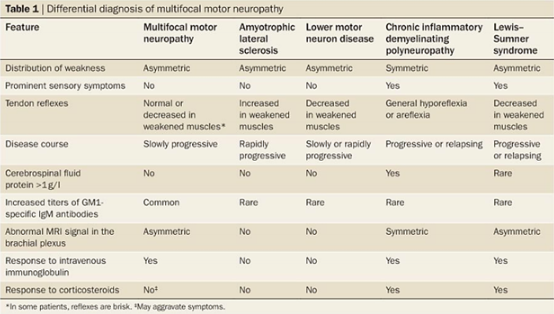 Consensus criteria for the diagnosis of multifocal motor neuropathy. Muscle & Nerve. 2002;27(1):117-121. ↑ Van Schaik IN, Bouche P, Illa I, Léger JM, Van den Bergh P, Cornblath DR, Evers EM, Hadden RD, Hughes RA, Koski CL, Nobile‐Orazio E. European Federation of Neurological Societies/Peripheral Nerve Society guideline on management of multifocal motor neuropathy. European journal of neurology. 2006 Aug 1;13(8):802-8. Available from: https://onlinelibrary.wiley.com/doi/full/10.1111/j.1468-1331.2006.01466.x. ↑ Pruppers MH, Draak TH, Vanhoutte EK, Van der Pol W, Gorson KC, Léger JM, Nobile‐Orazio E, Lewis R, Van Den Berg LH, Faber CG, Merkies IS. Outcome measures in MMN revisited: further improvement needed. Journal of the Peripheral Nervous System. 2015 [cited 9 May 2018]; 20(3):306-18. Available from: https://onlinelibrary.wiley.com/doi/full/10.1111/jns.12124. ↑ Breiner A, Barnett C, Bril V. INCAT disability score: a critical analysis of its measurement properties. Muscle & nerve. 2014 Aug 1;50(2):164-9. Available from: https://www.ncbi.nlm.nih.gov/pubmed/24723454. ↑ Merkies IS, Schmitz PI. Getting closer to patients: the INCAT Overall Disability Sum Score relates better to patients’ own clinical judgement in immune-mediated polyneuropathies. Journal of Neurology, Neurosurgery & Psychiatry. 2006 Aug 1;77(8):970-2. Available from: https://www.ncbi.nlm.nih.gov/pmc/articles/PMC2077640/. ↑ Van den Berg LH, Lokhorst H, Wokke JH. Pulsed high‐dose dexamethasone is not effective in patients with multifocal motor neuropathy. Neurology. 1997 Apr 1;48(4):1135-. Available from: http://n.neurology.org/content/48/4/1135.1. ↑ Lehmann HC, Hoffmann FR, Fusshoeller A, zu Hörste GM, Hetzel R, Hartung HP, Schroeter M, Kieseier BC. The clinical value of therapeutic plasma exchange in multifocal motor neuropathy. Journal of the neurological sciences. 2008 Aug 15;271(1):34-9. Available from: https://www.jns-journal.com/article/S0022-510X(08)00100-7/. ↑ Van Asseldonk JT, Franssen H, Van den Berg-Vos RM, Wokke JH, Van den Berg LH. Multifocal motor neuropathy. The Lancet Neurology. 2005 May 1;4(5):309-19. Available from: https://www.sciencedirect.com/science/article/pii/S1474442205700740. ↑ Zivi I, Maffia S, Ferrari V, Zarucchi A, Molatore K, Maestri R, Frazzitta G. Effectiveness of aquatic versus land physiotherapy in the treatment of peripheral neuropathies: a randomized controlled trial. Clinical rehabilitation. 2017 Dec 1:0269215517746716. Available from: http://journals.sagepub.com/doi/pdf/10.1177/0269215517746716.